Drummers, dancers, and speakers blasting Lady Gaga for a crowd of five hundred people linking hands and doing the wave is not the image typically conjured up when one hears of a World Health Organization event. A crowd gathered beneath a small stage decorated with slogans championing universal health coverage. Despite the morning’s chill lingering in the air, high spirits were contagious. 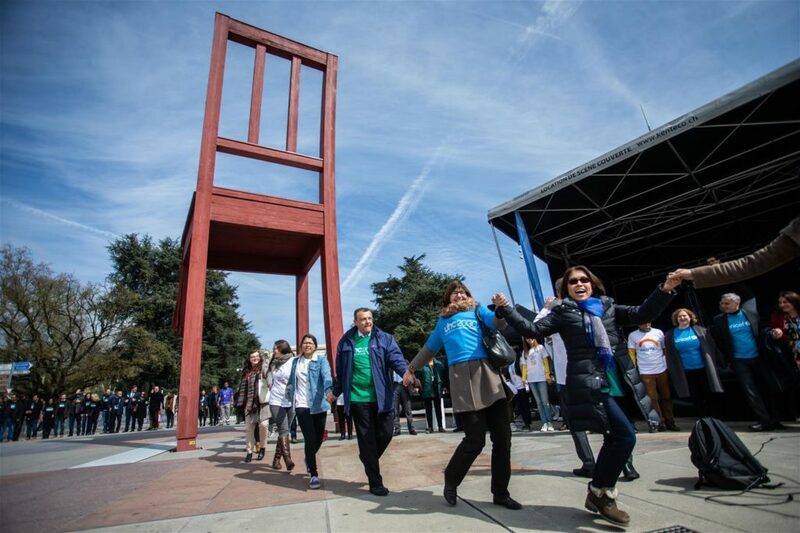 This was the scene outside the United Nations headquarters in Geneva on Friday 5 April, where activists and health officials gathered to celebrate ahead of World Health Day 2019. Celebrated annually on 7 April, World Health Day is a day of global health awareness sponsored by the WHO and other health organisations. The event is themed each year to draw attention to an issue of major importance to global health. Universal health coverage (UHC) has been the theme for the past two years. This year, a crowd assembled outside the WHO building and then walked to the Palais des Nations. Underneath the famous Broken Chair, they formed a human solidarity chain, joining hands as a show of commitment to providing accessible health care for people all over the world. Activists and officials from health organisations could be pinpointed by their bright t-shirts, and civilians were given WHO stickers to display their solidarity. “This is not what we expected from a WHO event, but it’s great to see community engagement like this,” Seth Faison, Head of Communications for the Global Fund to Fight AIDS, Tuberculosis and Malaria (Global Fund), told Health Policy Watch. Faison was quick to explain not only the Global Fund’s purpose in supporting the event, but his personal belief in health care for all. Several global health officials spoke at the event, reiterating the need for a global push toward accessible health care. Among them was WHO Director-General Dr Tedros Adhanom Ghebreyesus (Dr Tedros), who declared for the crowd that health is a right, not a privilege.